Welcome to the May 2018 issue of Black Grooves, sponsored by the Indiana University Archives of African American Music and Culture. This month’s releases are related to concepts associated with spring—invigoration and innovation—bringing to light new voices and collaborations that foster hope and discovery. 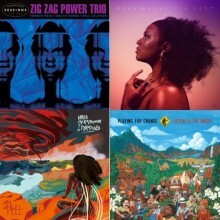 Four featured debut albums are grounded within soul, rock and reggae. The newly formed Zig Zag Power Trio (Vernon Reid, Will Calhoun & Melvin Gibbs) presents the rock fusion project Woodstock Sessions Vol. 9. Deva Mahal—the talented daughter of jazz icon Taj Mahal—shows her individuality on Run Deep. Starchild & The New Romantic’s Language features the artistry of Bryndon Cook, and Fort Lauderdale’s Army Gideon offers reggae rock fusion on Forsake Not. Jazz releases are bountiful. Words to Love by Houston drummer and composer Reggie Quinerly is a vocal jazz album featuring Melanie Charles and Milton Suggs; Don Braden’s Earth Wind and Wonder is a jazz saxophonist’s exploration of the Earth, Wind & Fire and Stevie Wonder songbooks; Miles Davis & John Coltrane: Final Tour is a 4-CD set featuring their final performances together during a 1960 European tour; and Idris Ackamoor & The Pyramids’ An Angel Fell is a spiritual jazz album exploring global themes such as catastrophic climate change and racism. International offerings root themselves in novel collaborations. Playing for Change: Listen to the Music brings together 210 musicians from 25 different countries for the goal of unifying today’s oft-divided societies, and the seven-piece South African afropsychedelic band BCUC (Bantu Continua Uhuru Consciousness) blends indigenous musical traditions with social commentary on modern Africa on its album Emakhosini. This month’s featured rap and soul artists include Los Angeles-based rapper Murs, who bares his soul on A Strange Journey Into the Unimaginable, and the veteran Chicago soul band Bumpus, offering Way Down Deep, their first release in over a decade. Gospel and R&B sow the seeds for this month’s reissues. Sister Sledge: An Introduction is a new “best-of” compilation featuring the four iconic sisters from Philadelphia, and Gotta Serve Somebody – The Gospel Songs of Bob Dylan is a DVD reissue documenting the making of the Grammy nominated album of the same name. Wrapping up this issue is our compilation of April Releases of Note.